The Hi5 provides 2 Channel RCA style audio outputs for separate audio monitoring if needed. The Hi5 also provides a looping SDI/HD-SDI output useful for connecting additional equipment, or for “daisy chaining” multiple monitors to the same SDI-HD-SDI source. 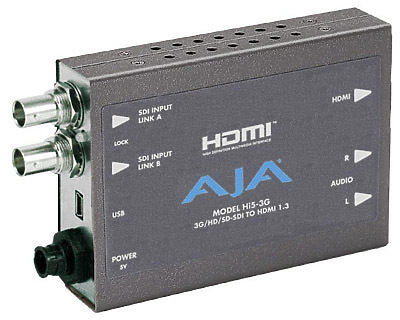 Hire the AJA HI5 SDI-HDMI Converter from Procam. Best service and rental rates for the AJA HI5 SDI-HDMI Converter and all cameras, lenses, sound, lighting and grip.